Saturday was a good day. It was restorative, and after last weekend, my morale needed a little restoration. I didn't do anything crazy-- I painted some baseboards and door frames, re-coated a door, taped off and painted the shelf supports in the built-in (which is nearing completion, and which I can't wait to show you). And then, I got domestic. I started with this. 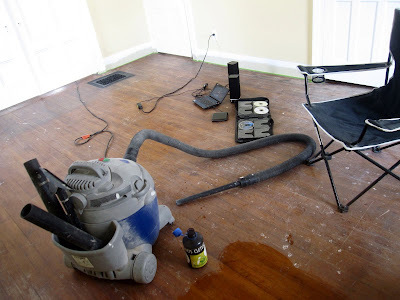 In between, there was much spraying of ammonia (diluted 50% with water; my heavy-duty cleaner of choice), much application of elbow grease, much suctioning of petrified mouseturds, much vociferous eeeew-ing and yuck-ing. I am really really crossing my fingers and hoping the mice are an old problem, not a current problem. Mice in my kitchen cabinets is one thing I don't want to deal with. Last weekend, we moved out the propane stove, which we're planning to sell. We moved the upstairs kitchen stove (electric) downstairs, and that's the one you see in the picture. 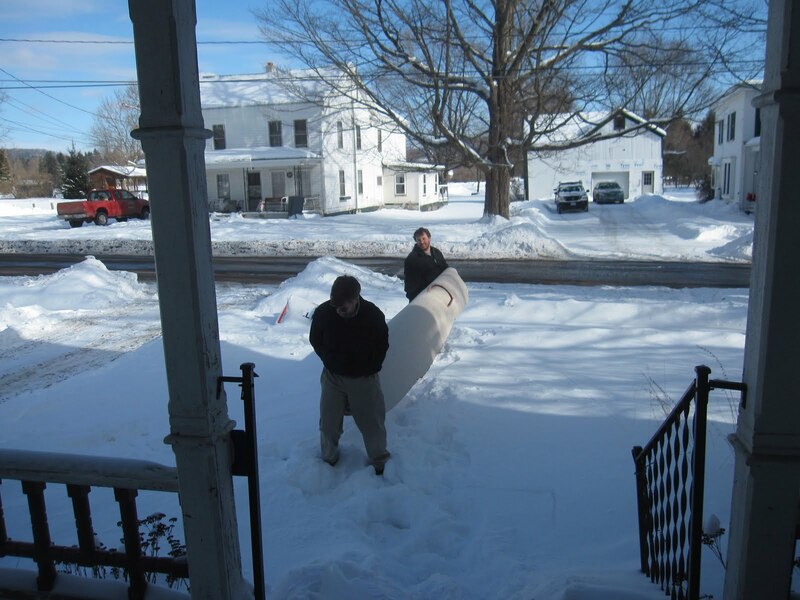 That one will eventually travel to Binghamton, to be installed in our old house when we're ready to sell it. We'll be moving our stove-- we have a lovely ceramic-topped electric range that we love, which was a gift from Patrick's parents for our engagement party-- to Gilbertsville. Got all that? I know no self-respecting foodie (like me) should cook on an electric stove, but I don't care. It's blissfully easy to clean. 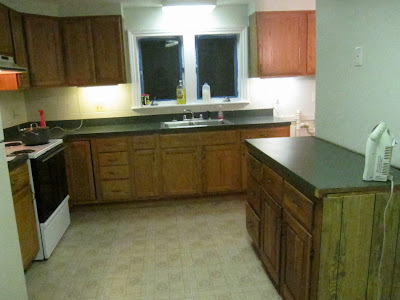 The cabinets aren't great, but the doors are solid wood, and there's plenty of storage space. 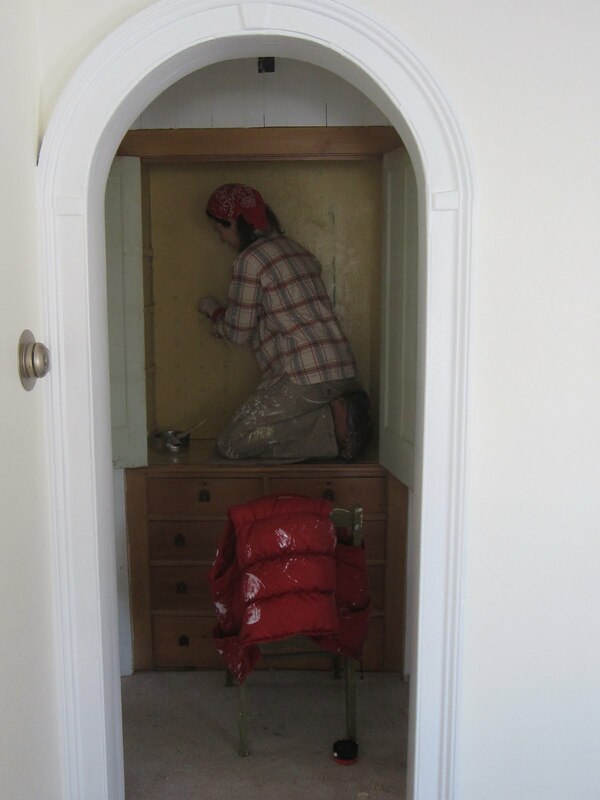 My dad is a custom cabinet-maker, and so, I believe there may be a good possibility that he'll be custom-making us a new kitchen in a few years. My mom's new custom-made kitchen comes first, though, so I'll wait. She gets seniority. I love that there are windows over the sink. There's another window over to the right, which you can't see, which looks right out into our enormous backyard. I was standing there this weekend, smiling over a mug of tea, just thinking, I can stand here and cook and watch our backyard. I'm going to be able to watch our kids someday. And then I got all misty. The other big thing I love is the pantry-potential. The right side of our kitchen, which you can't really see in the picture, is partly the space under the house's back stairs. It's where the dryer used to live, before we moved it out last weekend. 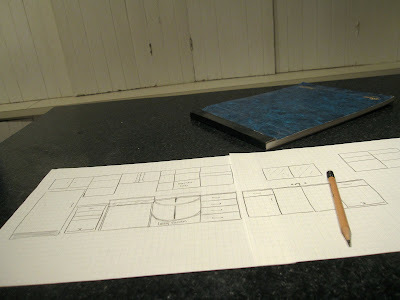 Someday, someday soon, it will house marvelously deep, handmade, custom shelves. Space for home-canned salsa and vegetable broth, space for a braid of homegrown garlic and a potato bin. I can't wait to make that happen. I think Saturday felt so good and productive to me because I got domestic for the first time in the new house. I puttered. The sun set, the windows blackened, and I was alone and content in my kitchen, whirring away with setting things to rights. My kitchen is my cockpit; I can't wait to continue making this one my own. Patrick was busy, too. 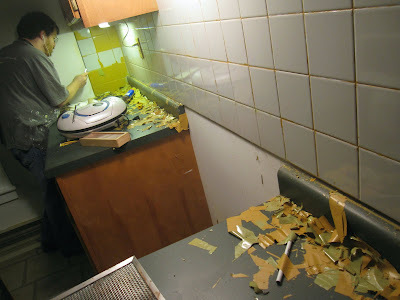 He scraped the paint off tiles in the upstairs kitchen. 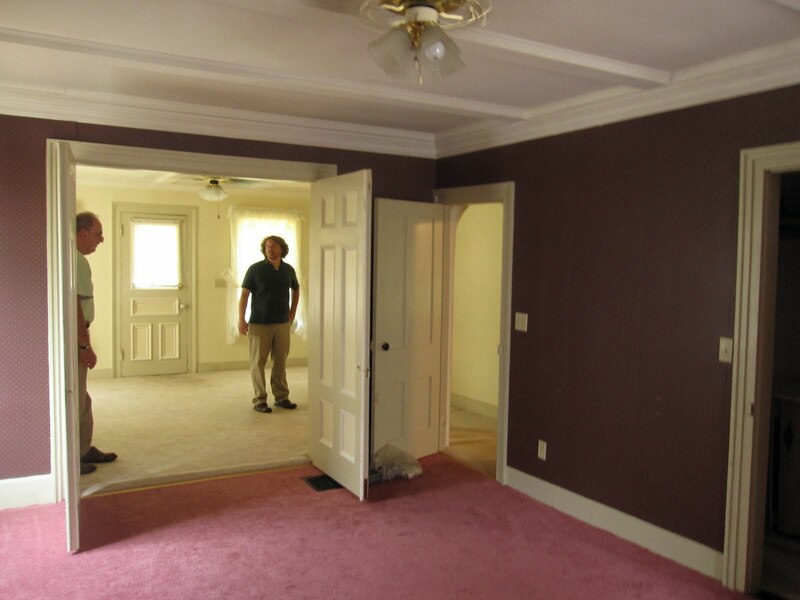 You may remember what this space looked like on closing day. Oh, right. That. Yes, they painted the tile. He was about at the point you see in the picture above when I walked in and said, "Uh, honey, that's awesome, but you know we're going to be tearing out those tiles...?" He continued scraping; I guess the man just has a vendetta against painted tile. Can't say I blame him. Those cabinets are going to be coming out soon, in preparation for turning this space into a laundry room. Laundry room, upstairs. What a luxury. And that, folks, was our weekend. Next weekend, we get back to the business of the stairwell. If there was ever any question as to the age of the former inhabitants of our downstairs, this should clue you in. It was a little old lady. 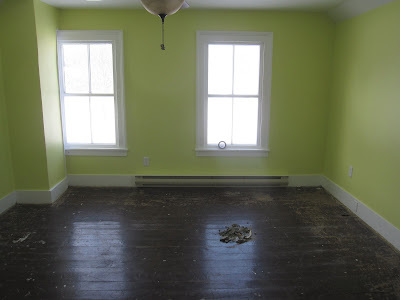 She liked seafoam green, and berry pink, and air fresheners, and she left her mark. 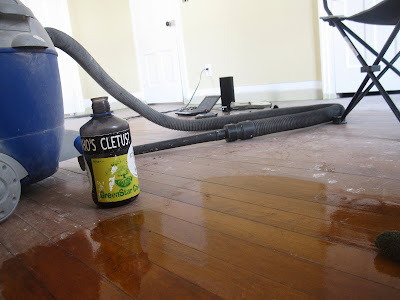 For the past three months, we've been de-geriatrifying the house, removing bathroom grab-bars and air fresheners, and tearing up seafoam green and berry pink carpeting. The wallpaper came out of this room fairly easily (read the story here), which was a blessing. And now the room looks like this. The color is Behr Castle Stone, and I love it lots. I love the floors more, though. We're not sure if they're maple or chestnut. Leave that one to my dad, the cabinet maker, to figure out. They sure shine up real nice. Patrick can tell you. I'm an organizer. A compulsive organizer. 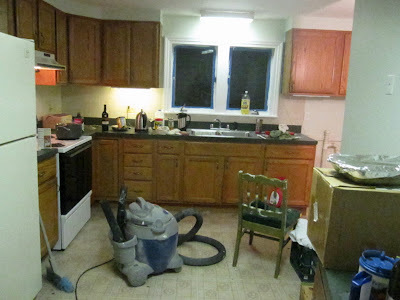 We've lived in our Binghamton house for four years, and I've over-hauled our kitchen ten times. I don't mean re-decorated. I mean, dragged everything out of its appointed place and appointed it a new place. Patrick has put up with this. For a long time, whenever he reached for something in its familiar place, it'd been mysteriously moved. It's taken me four long years to finally get it down. Everything is in a place that makes sense, and that's just the way my crazy, borderline obsessive-compulsive self likes it. And now that I've got it perfected, we're moving. Last night I got out the graph paper. I drew our old kitchen. I drew our new kitchen. I labeled everything in the old kitchen. I transferred all the labels to the new kitchen. Crazy? Yes. But now, see, there's a place in the new kitchen for my rolling pin, my waffle maker, and my eleven cookie sheets. That fact is a life raft in this increasingly chaotic surge of moving. Anyone with some good moving advice for me? What's the best way to pack? How do I make the transition as easy as possible? Has anyone ever labeled all their cabinets and drawers in preparation for a move? No? Okay, then, I really am nuts. I spent a lot of time wandering around the house this weekend, shivering through my long underwear and snowboots, feeling a little scowlish at the projects left on our list. I was reminding myself of how far we've come, how little we have left to go. I was trying to recapture some of the "magic" of that first weekend of work. Trying to remember what life was like before this house was in our life. A little dull. A little dreary. A little direction-less. Now, our priorities are squarely inline. We know where we're headed. It's good to remind myself of that now and then. This house is our life's work, and we've only just begun. The top photo there is from Saturday afternoon, after Patrick and his dad tore out the last two (gargantuan) carpets from the downstairs. Remember the same view, last weekend? Yeah. Goodbye, dingy old carpets! Hello, character. Hello, gorgeous. I spent the rest of Saturday extracting tack strips and carpet staples, which was probably the source of my scowlish-ness. Pulling staples can make anyone go mad. 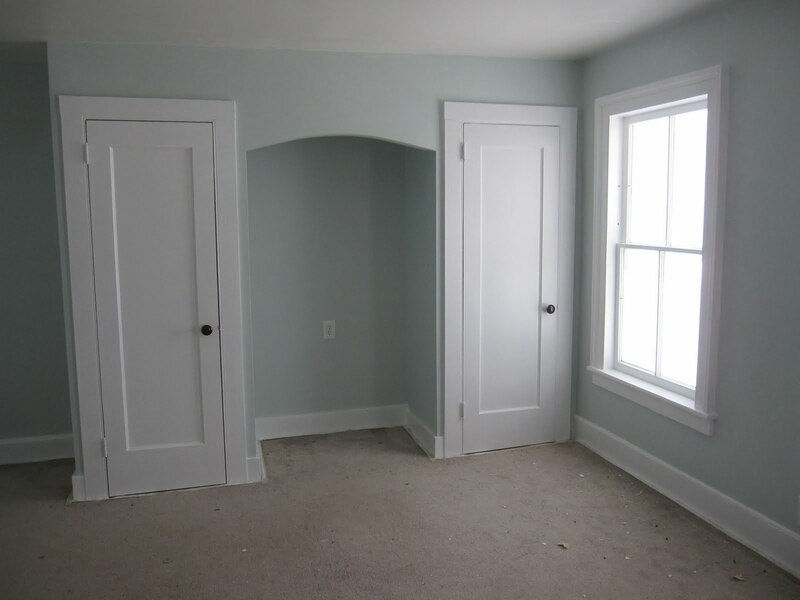 I painted a couple doors. I painted the inside of the built-in. 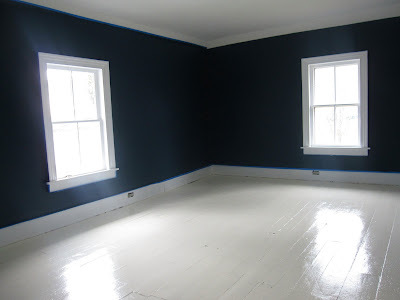 I painted some baseboards. The Guys spent most of Saturday (post de-carpet-ing) playing a game of Appliance Switcheroo. The upstairs fridge went to the garage. The downstairs stove went the garage. The upstairs stove came downstairs. The washer and dryer went upstairs. In contrast, my work of staple-pulling wasn't really that bad. Better than moving multiple appliances up and down stairs. 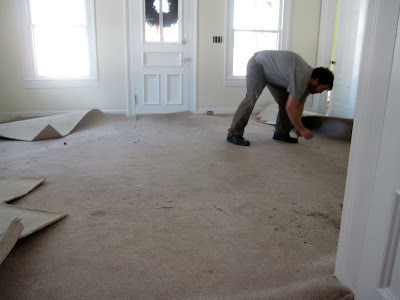 Remove last carpet from upstairs. Repair/re-install stairwell trim. 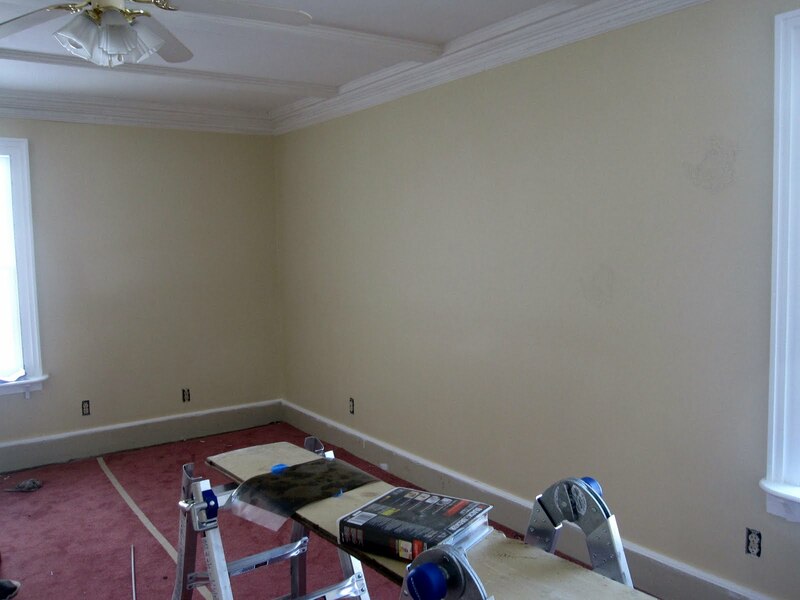 Repair/patch drywall. 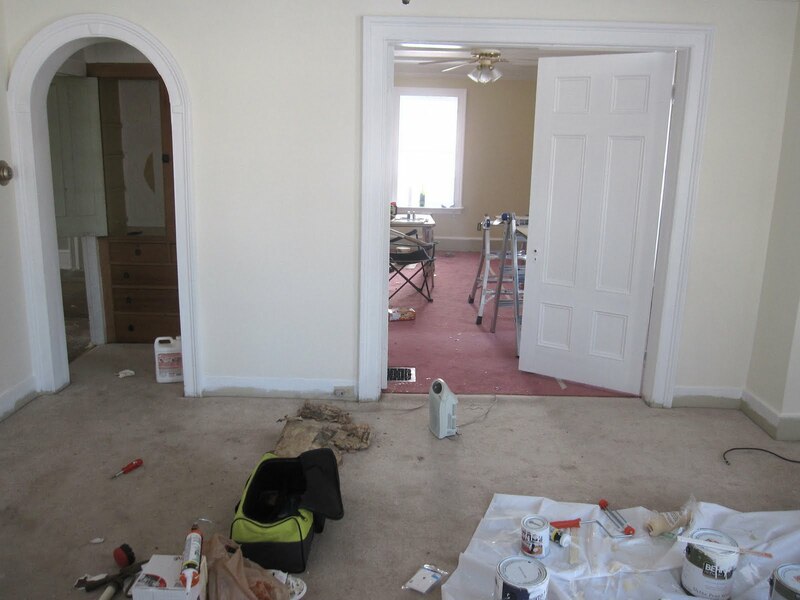 Prime and paint stairwell floors and trim. After that, it's move-in time. We are that close. Craziness. We can do it. You've Come a Long Way, Baby. This is going to be my new Friday blog thing. Not because we NEED a morale-booster (though, admittedly, the Christmas-morning glee of waking up early on Saturday morning and getting to work has worn off) but because it's fun looking back. It's fun to pat yourself on the back now and then. Hello, there, craft room/studio. My, my. Don't you look fine. I can't wait to set up and start creating in this space. It's the smallest of our bedrooms, (though still a fine size) but it commands some of the best views in the entire house. Which is, of course, why I chose it. Remember this picture from last weekend? We have big plans. 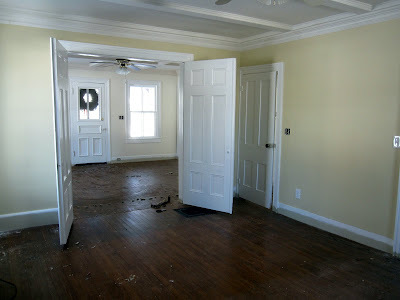 We have big plans for the whole house, and what's the fun if I can't share with you beforehand? So, I'm sharing. This is our dining room. It's a good size, about 12 x 14' I think, a lot bigger than our current dining room. This excites me no end. I love to entertain. A new dining room table is in the plans. We're planning on going to an auction (!) this weekend, with my father-in-law's F-150. (When you bring an F-150 to an auction, you clearly have furniture purchasing in mind.) We'll see what happens-- we've never been to an auction before. Patrick sagely advised, "It's probably best to not have expectations when you go to an auction." And darnit, he's probably right. Curtains, in some sort of bright lively print that goes with our palette. Sconces. Or maybe I'll just hang pictures over those wires poking out of the walls. 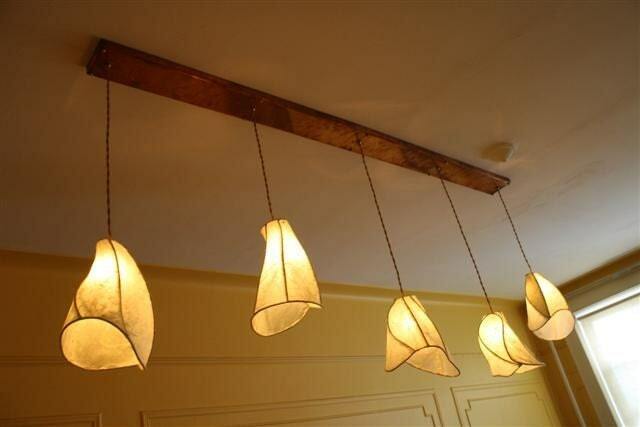 I'm not a huge sconce fan-- outside of bedrooms and bathrooms. Removing the ceiling fan. Our house has LOTS of tacky ceiling fans-- black or white blades with gold metal. Most are going to be refinished, because fans are nice to have, but this one is going. This is the magic of Etsy. (Here's the shop link.) I am so excited about this. Every year I give myself a birthday present. This chandelier was this year's pick. All the pieces in her shop are handmade, and custom, so mine isn't going to look exactly like this. Also, mine is only going to have three pendants. Eeee. Since we're totally, totally starting from scratch here, and since we have the ability to make the house really personalized, (as opposed to our Binghamton house, where we hesitated with investing too much time or personality into things, knowing we'd be leaving eventually) I'm shooting for One Big Wow per room. One va-voom aspect, a focal point. I think I can rest assured that the dining room is covered. Do you like it? What are your thoughts on sconces? 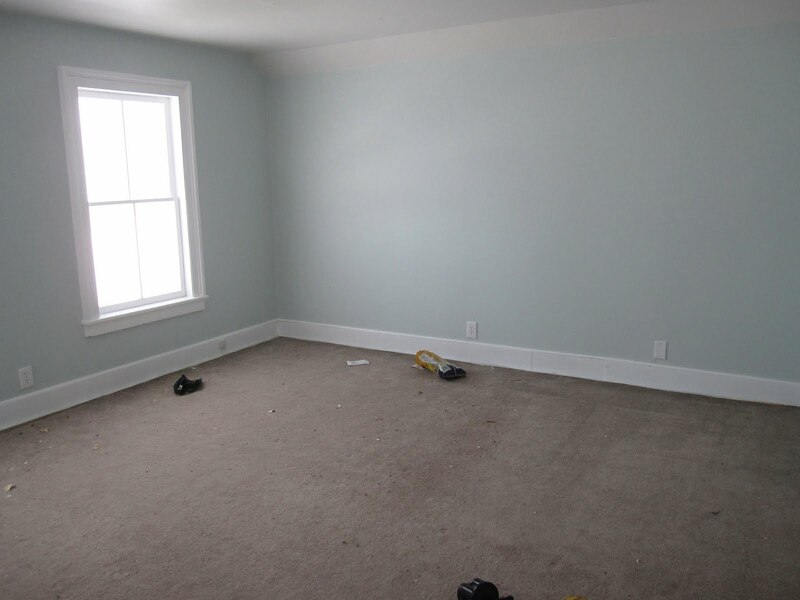 What would YOU do with that big empty wall? More plans to come! Progress continues. All rooms except the bathrooms and stairwell are DONE PAINTED. The enormity of that fact is slowly dawning on us. The painting is winding down-- and, you see, since painting has consumed our every weekend since November 5th, that's a big deal-- and we are wrapping our minds around it. What do we do now? Well, there's plenty of things. 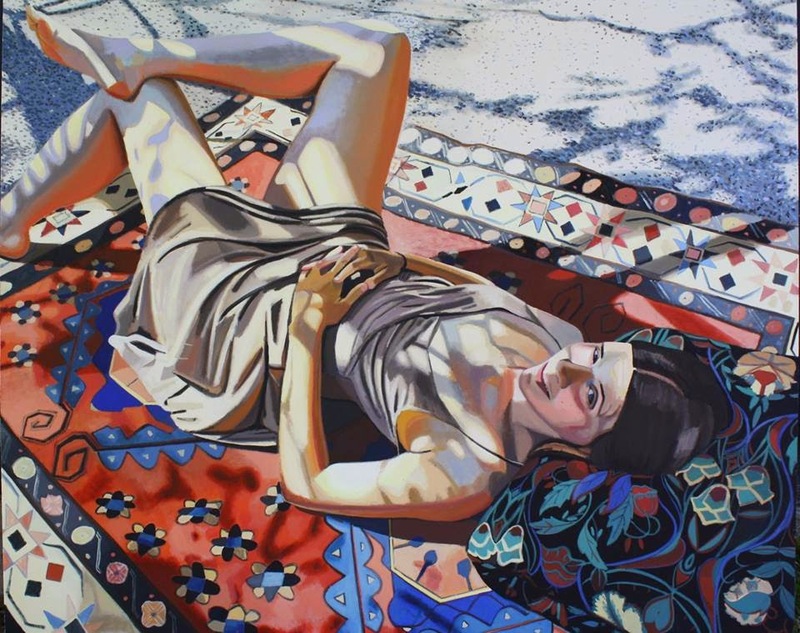 But now the work is more likely to be in the details. And I absolutely LOVE the details. This weekend I was experiencing some bizarre back spasms-- throbbing pain under my left shoulder blade when I bend a certain way-- so I was left to the low-impact things. I stripped the wallpaper out of our glorious built-in. I left Patrick to paint the entire kitchen. I swallowed a lot of Advil. And I wandered around taking pictures. There were lots of rooms, I realized, that I hadn't updated you all on since before Christmas. Progress has been made. With a bright snowy day outside, the light was cooperative, too. As I mentioned last weekend, we painted the dining room. This might be my favorite color in the house. Valspar Cliveden Gray Morning. The door with the latch leads to the basement. There's a little porch out the door, there. The Eatin' Porch. 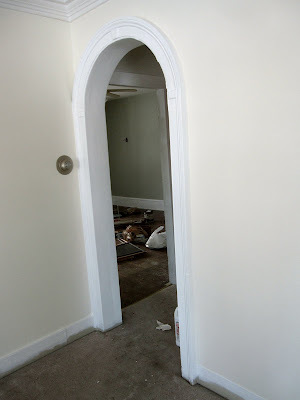 This is what the Dining Room looks like through the arch. 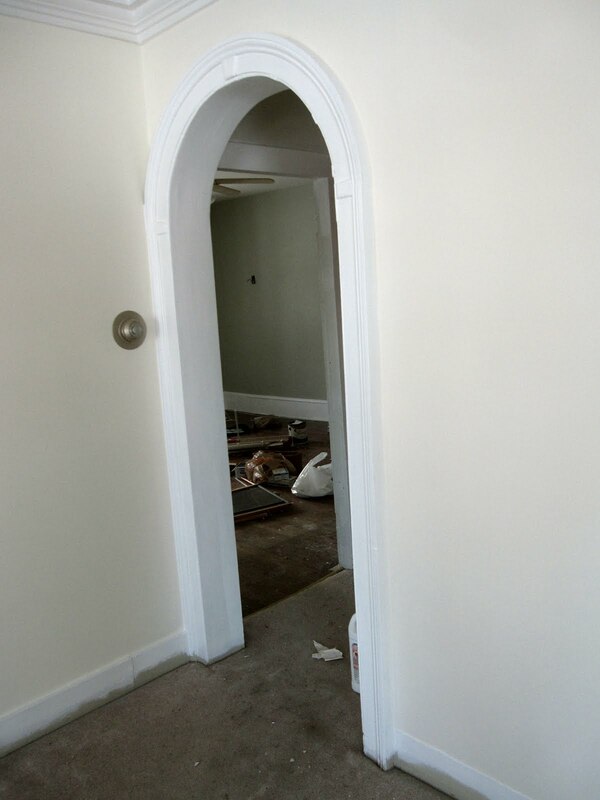 The built-in lives just inside the arch, but you can't see it in this picture. The color is Behr Parmesan. I love the double doors. I can't wait to entertain here. I can't wait to LIVE here. Inside the double-doors. We're calling this the Great Room. The wall on the right is where I traced flowers last weekend. 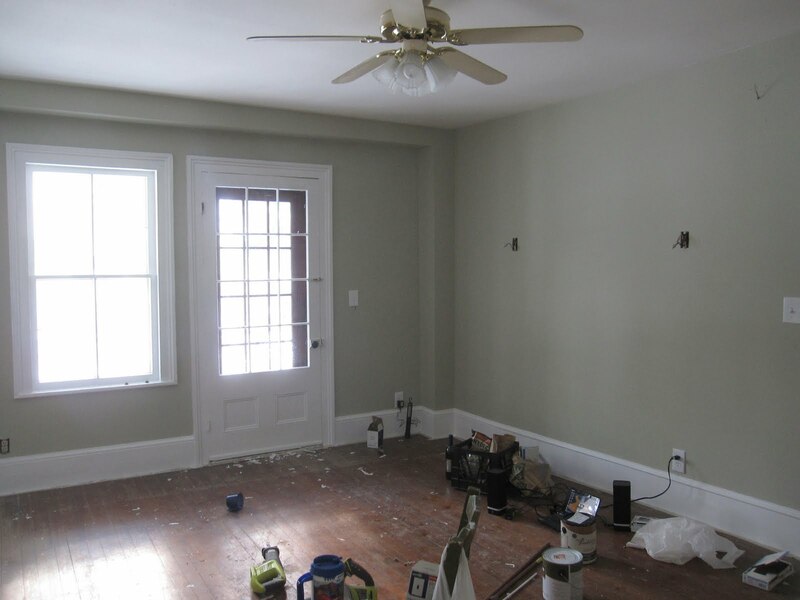 The color is Behr Castle Stone. Upstairs, things have been done for awhile now. First, we have a thoroughly regrettable color choice. This is Behr Pear, and it should be avoided like the plague. EW. We all have those occasional color gaffes, right? What were we thinking? 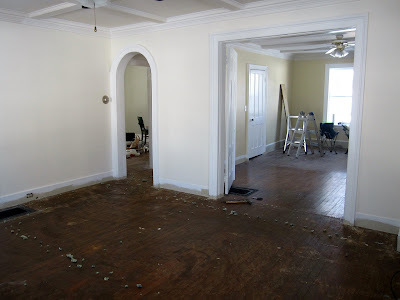 Patrick stripped the carpet out of here last weekend. 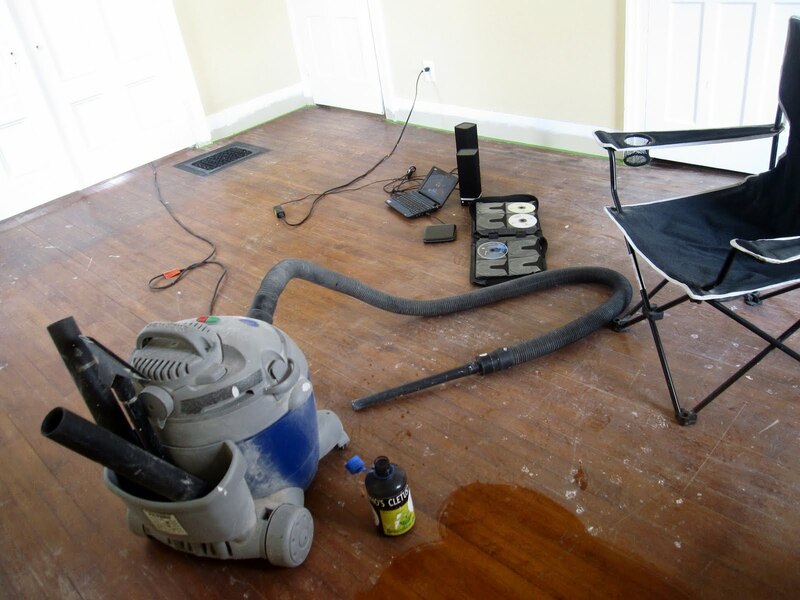 Next weekend, the floor gets refinished. This is our bedroom, and I'm in love. 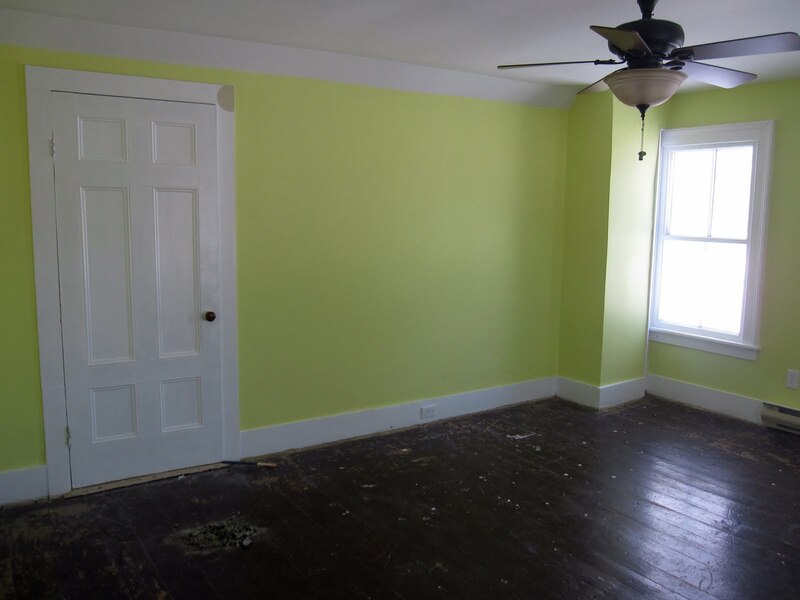 The color is Behr Limelight, which isn't lime-y at all, but more of a soft lichen color. I love the closets. Remember what they used to look like? And there you have it. Our House So Far. Next weekend, we're again enslaving my gracious father-in-law for some more Guy Work, including dispatching the last of the carpets and hooking up a working stove in our downstairs kitchen. Woot! I'm going to paint baseboards and hope my back heals itself. Soon.